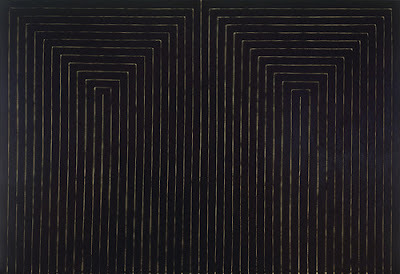 Frank Stella, “Gray Scrambled Double Square,” 1964, synthetic polymer paint on canvas. “Gray Scrambled Double Square,” detail. When the image is enlarged, the pencil guides and hand-painted, imperfect quality of the lines. are evident. “Astoria,” detail. 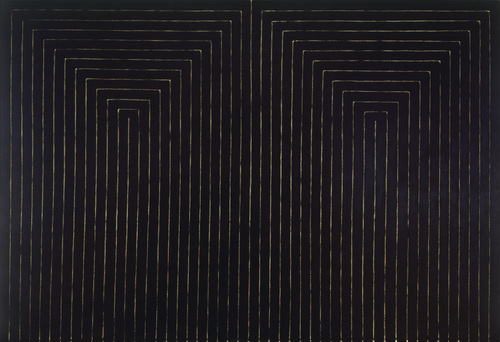 Stella has said he was influenced by Jasper Johns’s Flag paintings. “The Marriage of Reason and Squalor, II,” installation view. I stopped by MoMA yesterday to see the Picasso Guitar exhibition (check out the excellent exhibition web site here) and was pleased to find four Frank Stella paintings on display in the atrium. 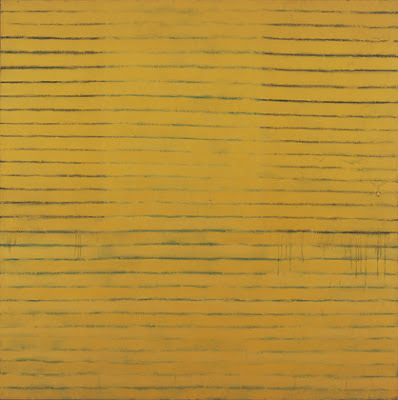 In these paintings, all from the 50s and 60s, Stella creates painted stripes outlining lightly penciled lines. Filling the canvas according to a methodical strategy, Stella liked the idea of the artist as laborer–he used commercial paint and a house-painter’s brush to further distance himself from aesthetic decisionmaking. The systematic nature of his process was a decisive break with the Abstract Expressionists and anticipated Minimalism, but the brushwork still conveys a poignant personal element. “My painting,” he said, “is based on the fact that only what can be seen there is there. . . . What you see is what you see.” In reproductions, Stella’s paintings often look like hard-edge abstraction, but up close his brushwork is something else entirely. 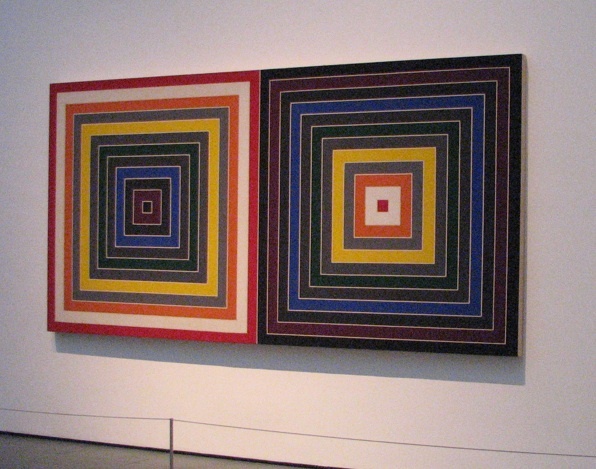 “Frank Stella: Works of the 50s and 60s,” The Museum of Modern Art, New York, NY. Stella has always been one of my favorite artists. HIs work is amazing and thank-you for posting some of his earlier works. I love them too! Thanks for this post, brightened my day, but also made me think I might be wasting my life and should do more painting. Off to Tate London this weekend to see if they have any Stellas on display, haven't seen one for a while. btw best show in London right now is the New York 70's show at Barbican. Trisha Browns dance pieces being performed every hour, amazing. It's the most striking, sculptural dance I ever saw. Stella didn't sit still with his art and that's the best and bravest thing you can hope for in an artist. A favorite of mine is a painting(wall sculpture) titled "Kastura". Just as it is a traveling adventure to allow yourself to go inside a Jackson Pollock, so too does this painting/sculpture by Stella invite the viewer inside. There is an added bonus provided by the third dimension which allows side views as well as the frontal experience. Thank you for the post and sharing detailed pictures. I love pure painterly experience from Stella's earlier works.